St. Josaphat Basilica Roman Catholic parish church is located on the corner of Lincoln Avenue and 6th Street on Milwaukee’s historically Polish south side. The parish was founded in 1888, the fifth in its burgeoning Polish immigrant community. After the first church burned down and a second was too small for a parish of 12,000 members, its pastor, Fr. Wilhelm Grutza, a former blacksmith, hired architect Erhard Brielmaier to design a new structure seating 2,400 worshippers. This plan was unveiled in 1896. Grutza learned that Chicago’s U.S. Post Office and Customs House was to be torn down. With Brielmeier’s approval, he bought all its materials, even the doorknobs, for less than $100,000 in the currency of the time and shipped them to Milwaukee on 500 flatcars. The entire structure had cost $4 million in 1880. Brielmeier drew up new blueprints for a church, a smaller version of St. Peter’s Basilica in Rome—with a matched pair of bell towers and a soaring central dome. While tirelessly raising funds for the project, Grutza and his parishioners simultaneously labored over the next four years to build the church. On July 21, 1901, the new edifice, its 220-foot high dome soaring high into the sky, was dedicated before 4,000 worshipers. Archbishop Frederick Katzer of Milwaukee officiated, assisted by church dignitaries and fifty-eight priests. Five weeks later the exhausted Grutza died. Despite the volunteer labor and Grutza’s economizing, the parish, whose members were mostly manual laborers, was left with a $382,000 debt (about $10 million in 2014 dollars). Many had mortgaged their homes to help finance construction and faced losing them if the parish went bankrupt. Their plight brought sharp criticism from Michael Kruszka, editor-publisher of the Kuryer Polski newspaper, who also criticized Milwaukee’s new Archbishop, Sebastian Messmer, for his mishandling of the crisis. In 1910 Messmer and the Order of Conventual Franciscan friars of Buffalo, New York agreed that the Order would take over the parish. Under several dedicated pastors, most notably the Rev. Felix Baran, the debt was erased in the mid-1920s. Work then began to decorate the church’s interior dome and walls, which aside from the giant mural of the martyrdom of the seventeenth century St. Josaphat Kuncewicz (dedicated in 1904), had been painted white. Several of the new murals were proudly and distinctly patriotic in their identification with Poland. Pope Pius XI raised the structure to Basilica status in 1929, an honor previously bestowed on only two other American churches. 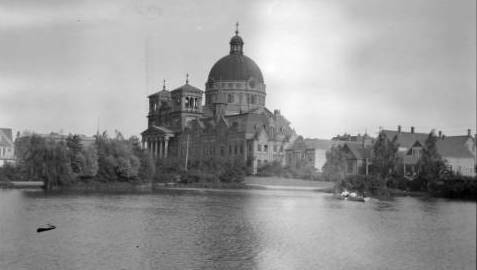 A 1940 fire caused smoke damage to the Basilica’s murals. A severe summer 1984 storm ripped away part of the dome’s copper roof. The resulting water damage eventually became a threat to the entire structure. In 1991 the parish initiated a major fund drive, one going beyond making repairs and aimed at restoring the Basilica to its historic splendor. Local activists Conrad Kaminski and Michael Murry of the nearby Lincoln State Bank, together with the Franciscan friars and leaders across greater Milwaukee established the St. Josaphat Basilica Foundation. They raised over $6 million and achieved their mission and more. In 1998 a new pavilion and visitors’ center opened, named in honor of the Poland-born Pope, John Paul II. Subsequent fund drives have further enhanced the Basilica and brought it even greater public appreciation. Added to the National Register of Historic Places in 1973, St. Josaphat Basilica is a major visitors’ attraction in greater Milwaukee. Located in the Lincoln Village neighborhood of modest homes where few Polish Catholics still reside, the Basilica remains a source of enormous pride to the Polish American community and a center for its important Church events. One example: in 2003 Archbishop Timothy Dolan chose the Basilica as the site where the twenty-fifth anniversary of John Paul II’s pontificate was celebrated. The Basilica today serves an ethnically diverse Catholic community. It also regularly hosts concerts of the Milwaukee Symphony Orchestra and Chorus. ^ Waclaw Kruszka, A History of the Poles in America to 1908, Part I (Washington D.C.: The Catholic University of America Press, 1993), 46; John Gurda, Centennial of Faith: The Basilica of Saint Josaphat, 1888-1988 (Milwaukee: Basilica of St. Josaphat, 1989), 9-11; John Gurda, The Making of Milwaukee (Milwaukee: Milwaukee County Historical Society, 1999), 174. ^ Gurda, Centennial of Faith, 10-16. ^ Anthony Kuzniewski, Faith and Fatherland: The Polish Church War in Wisconsin, 1896-1918 (Notre Dame, IN: University of Notre Dame Press, 1980), 41-42; Angela T. Pienkos, A Brief History of Federation Life Insurance of America, 1913-1976 (Milwaukee: Haertein Graphics, 1976), 2. ^ Gurda, Centennial of Faith, 30. ^ Gurda, Centennial of Faith, 20; Gurda, The Making of Milwaukee, 174-175. ^ “Fire Damages St. Josaphat’s Basilica Here,” The Milwaukee Journal, December 27, 1940, 1; Jennifer Kustra, “Fund Drive for Basilica Seeks $3.5 Million,” The Milwaukee Journal, July 17, 1991, B1; About the Basilica, St. Josaphat Basilica Foundation website, last accessed August 16, 2017. ^ “Top Tourist Destination,” St. Josaphat Basilica Foundation website, last accessed August 16, 2017. ^ Tom Heinen, “A Quarter-Century of Hope, Inspiration,” Milwaukee Journal Sentinel, October 12, 2003.